When you’re hosting a party and need a constant cycle of fresh ice, a portable ice maker is the ultimate convenient tool. Features that make it a popular portable ice maker include its user-friendliness, capacity, and durability. In the following Ivation Portable High Capacity Ice Maker review, we address those features and more to decide whether or not this ice maker will serve to benefit you. The Ivation Portable Ice Maker uses modern compressor refrigeration technology to produce hollowed-out ice cubes. It has a compact, sleek design and can fit just about anywhere in your house. It also features a see-through large window on its lid to monitor the ice level. It takes little time to set up, too, as you just have to plug it in, pour in the water, and start it up. Concerning how it functions, this features an easy-push touch button. There are three LED icons to indicate “Ice Full”, “Add Water”, and “Work”. This, along with a beeping mechanism, can also alert you to low water levels and when the machine has reached its maximum ice capacity. For safety purposes, it has an automatic shut-off feature when it reaches max capacity. This machine is capable of making about 9 cubes during each cycle and takes about 6-10 minutes for each operation cycle to run through. With the removable ice bucket, you can quickly transfer to your freezer or use as desired. It is important to transfer the ice out as the machine is not meant for storage. This product appears to function better when used indoors. For occasions, this is the type of ice maker than can help during a house party, at the office, or just for a small family to use on a daily basis. You can even take it with you on the RV as long as it has an outlet. This versatility is due to both its portability and its condensed size. It is light and easy to handle while being small enough to tuck away in a corner or countertop. On the downside, although this can produce over 20 pounds worth of ice in a 24-hour period, it may not be enough if you need a lot of ice on hand for events or parties. It is better to prepare the ice machine far in advance if you truly need a greater quantity. Even for a portable ice maker, it has a good compact size to save on space. It features an automatic shut-off function for safety purposes. The ice maker is easy and quick to set up. If the ice melts, the water will recycle back into the reservoir. The inside lacks insulation, so the ice must be immediately removed or else it melts. It takes some time to make a large quantity of ice. For some, it can come across as noisy. In the water reservoir, there is no fill line. To ensure that our Ivation Portable High Capacity Ice Maker review covers all aspects of the product, we examined different consumer opinions. Some users have unfortunately encountered a lack of quality when it comes to the overall construction of the ice maker. They say they noticed some design flaws (e.g. stripped screws, cracked pieces), and some also noted that the machine only worked once or twice before failing. Another Ivation Portable High Capacity Ice Maker review spoke about enjoying the machine, but explaining how it does require a breaking in period. To elaborate, they say the first few cycles may produce smaller cubes that are still wet rather than completely frozen. In order to correct this, they simply continued to cycle through until all the cubes were the correct size and frozen over. Many of the reviewers mentioned their enjoyment of the size and how it can fit just about anywhere. However, when it comes to the capacity, they did explain that it may be better to set aside a few hours if you are planning to make ice for a large number of people. In the end, when you look at an Ivation Portable High Capacity Ice Maker review found on Amazon, most praised the machine’s capabilities. They seemed especially impressed given the price range when compared to other ice makers. Note: if this ice maker isn’t exactly what you were looking for, make sure you check out similar items in our collection of the best portable ice makers on the market where the Ivation Portable High Capacity ice maker got the first spot. 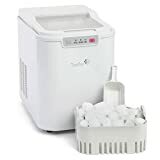 To conclude this Ivation Portable High Capacity Ice Maker review, we feel that if you are looking for something basic, this is as simple as they come. It produces an average number of ice cubes in a decent amount of time, but it would be nice if you can get more out of it per cycle. If you are looking for something a bit more elaborate, then this machine from Ivation may not be the greatest choice. However, it gets the job done if all you want is a straightforward ice maker for the family or office. Have you used this product before? If so, feel free to share your experiences and opinions with us.